Okay, so we climbed the long ice thing in they valley. Now it’s time for our original objective. Actually, I was confused with what the objective was. We talked so much about freeclimbing an old aid line, that I for some reason thought that was our objective. Dennis seemed more aware on what to climb. As I’m still feeling sick even after the forced hot-weather-melting-ice-restday yesterday we decided I should do the first pitch and see what I feel like on the rest of the route. We were the only ones today in the valley. The avalanches from the previous day showed us we’d made the right choice on taking a restday yesterday. Today the Eisarena was one big frozen cold mass again. We geared up and I climbed the first pitch of the route. The ice seemed dry from a distance but felt wet and delaminated when I swung my axes. It sometimes hardly held my feet, making me kick more then three times every move. Some people call the soft ice ‘ego-ice’ as it takes your axes so easily by just swinging once every move. Leadclimbing in such conditions is different...If my axes get in that easily, I thought, then how easy would it be to rip out again...? I got a good look at the mixed pitch we were about to climb. With in mind that this was ‘Rodeo’ and old AID line that had never been freeclimbed. Two days ago I saw the climbers pulling on the slings and pitons in the pitch, so I was quite conveinced this must be the AID line. Insecure as I always am I decided it would be good if Dennis would try this pitch and if he couldn’t make it, I’d try it. The small dagger Dennis’ was traversing to barely touched, totally delaminated and way smaller then two days ago. Dennis placed his axes as high as possible in the fragile thing, balancing, hardly touching with his feet. He made it through and we were both happy he could clip a fixed nut. Next was a iced crack for seven or eight moves. Dennis desperately hammered his axes in, and mentioned to me that it felt like his axe was moving. Like the pick or the head of the iceaxe had loosened. This was not the time for bailing gear, so we kind of ignored it. On top of the crack the small ice curtain was winking to him, get me, swing me, come closer. Thats where the route was heading, but as all the ice that could be used two days ago had melted away, it was a super long reach to the wet curtain. Waiting, watching, moving for a bit and finally really reaching, Dennis made it to the curtain, hastily moved to the top part with his axes to place a blue Totem cam in the horizontal crack above him. Now I was safe to head for the huge hanging ice above me. I precisely placed my feet and slowly moved up in the big wet snowy curtain. Luckily for me there was already some sort of feet feature. Slowly working my way up the curtain getting stupidly pumped being very nervous. Finally the curtain seemed to be sort-of attached to the wall and I placed my first screw.. Pfff... what a relieve. Not much later he screamed. I’d never heard him scream like that! I knew straight away that he was falling. I was instantly 100% alert and bright, but the rope never came snug. “I fell” he screamed down, “but it’s okay”. Soon after he made belay in slightly better ice all shaky from the adrenaline boost rushing through him. Later we discussed the 'fall' a couple times and came to the conclusion that Dennis saved himself because of his speedclimbing experience. On the speed comps it often happens that you 'rip' out of the ice, and then you always try to get back in as fast as you can. 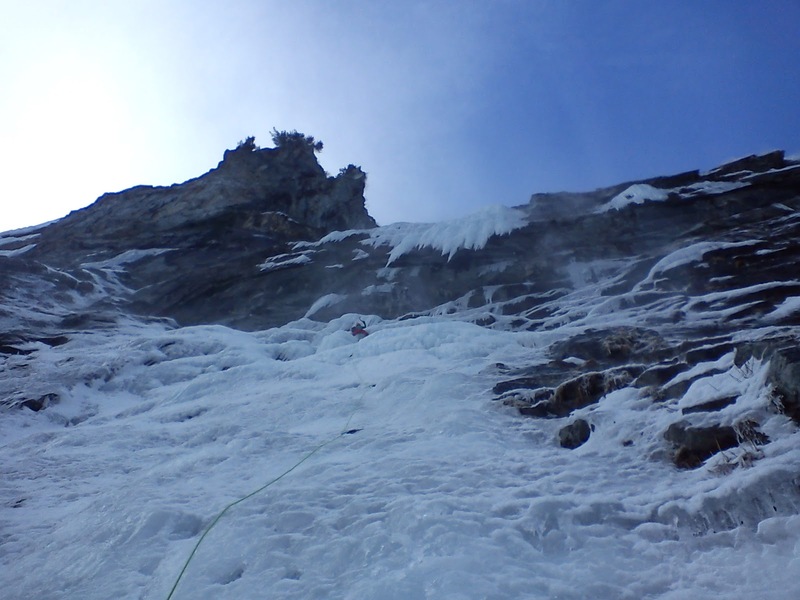 I couldn’t see her and had to keep the rope loose to avoid pulling off all the ice that she still had to climb. Slowly she climbed through the melting dagger into the granite crack. I heard she didn’t hammer here axes in, trusting on the newly created ice holds in the crack. I’m trying to keep the rope tight but I don’t want to brake the fragile ice above Marianne. Unable to see under roof I haul up the rope bit by bit. Suddenly there is a small jerk on the rope. I try to tighten the rope and hear a little shriek.. The next moment the rope comes fully tight end there is a huge piece of ice tumbling down... Marianne your oke!? I swung down, stretching the rope all the way back mid-air to the height of our previous belay taking with me a good bit of the big curtain above me that wrapped around the rope. One iceaxe in my mouth, one iceaxe in my hand made it hard to scream but made nice teethmarks on my axe. Okay, second try. Disappointed, should have done this in once! I started again, onto the small dagger, into the crack, avoiding the wrong hold and making sure my axes stuck inside the iced-up crack. This time trying to communicate a bit more I hear Marianne is coming closer. She made it through the crack section traversed and climbed the curtain nicely. 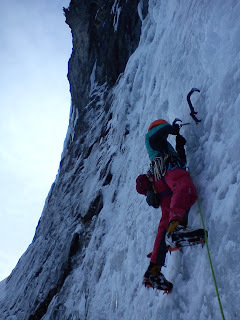 From here on it’s still 100m+ to go so Marianne climbs up the WI5 ice stretching the 50 M single rope to the max. I start following when the rope is all gone. Still very wobbly and insecure now the adrenaline is gone I’m going very slow. Also not sure that Marianne made belay already. After a slushy pitch I find Marianne in the middle of the waterfall. She got stuck here because she ran out of rope. So I start leading very careful trying to knockdown as little ice as possible. I’m starting to feel less and less secure now the last bit of adrenaline is gone... Getting higher running out of rope and only 10 more meters through the gully to top out I’m stuck. No more rope. No more quickdraws only 2 screws. So I yell to Marianne to start climbing place the 2 screws put them together fixed my Microtraxion and climbed on very slowly but secure avoiding any ice fall. All the time we got showered by snow, the higher we got the worse it became. Although the last section wasn’t as hard as the first pitches it wasn’t comfortable to climb. The snow was painful on my face but I was warm, and had enough energy. I still felt sick, headache, cough, and a painful body, but I didn’t care, as this was probably the most real iceclimbing I’d do these weeks. We topped out in the snow and hiked down through the old avalanches. Happy we’d done it and happy we were safe we rolled down the hill. Now I really need to rest as the cold fever isn’t getting any better. Just a couple more days my dear body, just a couple more and then you have weeks to recover. Come on now!